Majimaya in Kappabashi, Asakusa is a popular store selling dessert and pastry molds, and other baking goods. Visitors who want to buy Japanese confectionery tools will find everything on their shopping list here! This shop is full of unique treasures. Kappabashi, Asakusa, said to be Japan’s number one kitchen goods and cutlery street, is home to numerous cooking and tableware stores. Majimaya Confectionery Tool & Gear Shop (Majimaya) is a particularly great option for those searching for pastry and confectionery tools. Majimaya is a shop that has a long and prosperous history despite World War II and nationwide economic troubles in the past. The MATCHA editorial department went to learn the story behind the store and its best-selling products. The shop before Majimaya in Kappabashi was Majima Kisaburo, Japan’s oldest confectionery tool shop, located around Mansei Bridge in Kanda (presently Akihabara). Mr. Saburo Yoshida, the current president’s grandfather, later took the name “Majima” from the shop and opened a new shop in Kappabashi. Bread and cakes grew popular in Japan following the end of the war. Majimaya thus became a shop specializing in tools such as bread machines and cake molds to make Western sweets. Majimaya began selling pastry and baking tools to the general public during Japan's recession after the collapse of the economic bubble in the 80s. Their sales grew despite the economic slump. Things often don’t go well when beginning something new. Mr. Yoshida, the company’s third president, had trouble finding manufacturers to make molds and pans to sell in the shop. However, he would contact companies selling products he liked, visited them, eventually finding suitable business partners. MATCHA's editorial team was very impressed by this story from Majimaya's kind and persevering president. The wooden wagashi (traditional Japanese sweets) mold, made by hand, is one of the shop’s most popular products. In the past, visitors could watch as a craftsman made the wooden molds inside the store, but the craftsman has since retired. Mr. Yoshida is currently searching for a new craftsman and is looking forward to the day when they will use the carving tools again (pictured above). 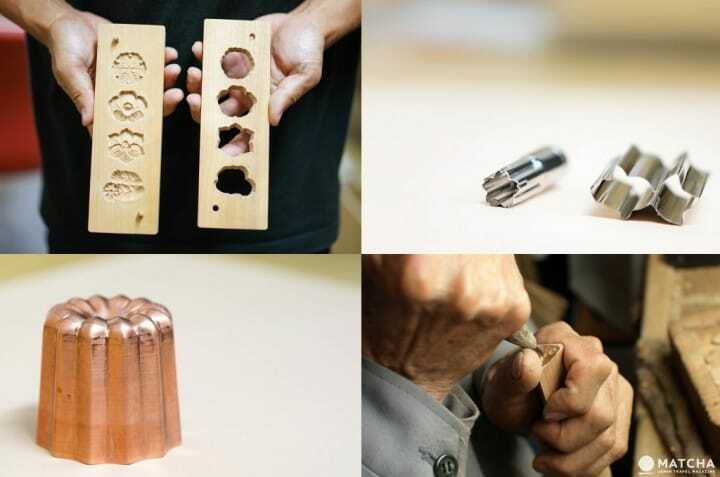 Mr. Yoshida himself, who learned carving skills from a craftsman at a young age, is also able to make wooden molds. Due to his expertise, he needs just three to four hours to make one mold--a short amont of time considering the detail of the carvings. In a small drawer are several rough sketches for wooden molds, all of which were created from the inspiration of craftsmen. You’ll also find branding irons that will press a design onto the top of Japanese sweets and pastries. They can also be used on leather goods or wooden products. The various stamps on display are of all shapes and sizes. Among the designs are dog and cat pawprints, small prints, cherry blossoms, Mt. Fuji, a design for onsen manju (hot spring buns), a head and tail design for sweetfish cakes, and rabbit ears. What you should definitely check out if you love baking are their cookie cutters, available in up to 1,000 different designs. They also carry original Majimaya cutters. They are reasonably priced, ranging from 120 yen to 1,500 yen (including tax). This is a Majimaya-limited baby bear cutter (162 yen including tax). The length and angle of both arms are posed to allow the bear to hold nuts or dried fruit! Majimaya also sells products made in collaboration with chefs and major brands in addition to their original product line. For example, their cat cookie cutter is a product is a collaboration with German brand, BIRKMANN (626 yen each, including tax). This is a rare BIRKMANN item as the company doesn't normally do collaborations. Be sure to look for this cookie cutter in Japan if you’re interested. Pictured above is the very popular copper canelé mold (1,177 yen including tax). Canelé made in this mold will come out a beautiful color thanks to its even heat conduction. The baked canelé is easily removeable from the mold, making it even more popular. The mold is made in Japan! The adorable Mt. Fuji mold (565 yen including tax) is another popular product, often out of stock. Use this mold to bake pastries and chiffon cakes in the shape of Mt. Fuji. You can make a snow-covered Mt. Fuji by pouring white chocolate onto the baked pastry. Do you know how to use these tiny tools? These goldfish and cherry blossom-shaped molds are tools often used in Japanese sweets. (Cherry blossom: 518 yen, Goldfish: 669 yen, both including tax). The products at Majimaya, ranging from cookie cutters to molds for Japanese sweets and pastries, have changed with technology and history. However, the care placed in selling excellent goods has stayed consistent. When we asked Mr. Yoshida, “What would you like to try next?" we were shown a model of a new shop that was scheduled to be constructed at the time, meant to sell over 1,000 types of molds and tools. “My ultimate challenge and happiness is to create a space that people who love making sweets can be satisfied with." *This article was translated and revised from an article originally in Chinese. Bumpodo - Inside The Living History Of Art And Stationery!